Archaeologist John L. Sorenson has found interesting correlations between Book of Mormon events and pre-Columbian American history in Mesoamerica (central and southern Mexico and northern Central America). 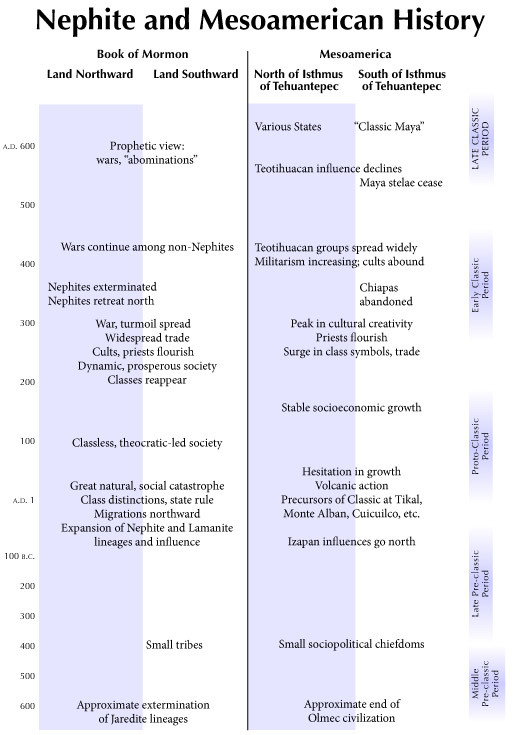 As depicted in this chart (which, like other archaeological time lines, is oriented with the most recent date at the top), Sorenson suggests that Olmec and Jaredite civilizations correspond historically, while the civilization existing in the Mexican state of Chiapas in highland Guatemala can roughly represent the Nephite and Lamanite peoples. In addition, the dates of Izapan influences spreading northward correspond with the people of Nephi finding the land of Zarahemla and joining with the Mulekites. Because the peak Izapan development occurred between the second century B.C. and the fourth century A.D., Izapans are believed to have been Nephites, although the exact association is unclear. While the Teotihuacans were not related to the Lamanites directly, existing probably as a remnant group of the Jaredites, they are believed to have allied themselves culturally and possibly militarily with the Lamanites near the end of Nephite civilization. These chronological and geographic correlations offer secondary evidence supporting the ancient origin of the Book of Mormon.